This salmon is very easy and super yummy. Boy, Hubby and I love it. Girl breaks into tears when faced with the task of eating seafood, but Boy loves it, so every once in a while, she has to put up with it. If making this for kids, I recommend using the mildest miso that you can find (like shinsu). Sometimes, I like to use the Splenda Brown Sugar Blend (a mix of brown sugar and Splenda) instead of brown sugar. 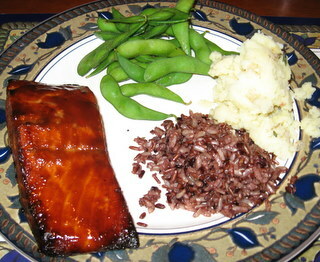 I also like to marinate the salmon in a little teriyaki before baking, just to add a bit more kick. Quite yummy recipe – healthy and easy, too. This recipe is one of Boy and Girl’s absolute favorites. I like to add a little bit of Emeril’s “Baby Bam” seasoning (my “go-to” spice for just about everything). 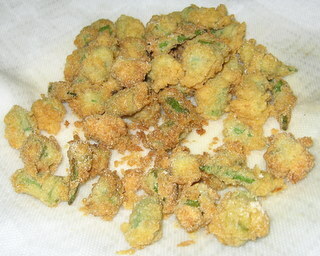 Hubby won’t touch okra with a 20 foot pole, but the kids and I LOVE it. 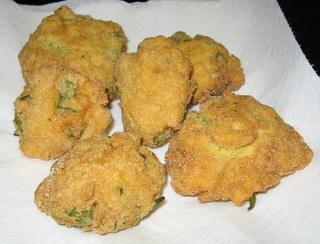 You can follow the instructions precisely (the part about letting it sit for 10 minutes is important) to make individually-breaded okra chunks, or you can just mix all of the ingredients together and form them into fritters. You may need to add a little extra buttermilk, flour. or cornmeal to get the right consistency for them to hold together Before frying, I usually roll them in a little extra cornmeal after they’re formed into croquettes. Don’t make them too big or the outside will get too browned before the inside is cooked all the way through. YUM. Girl and I LOVE Gazpacho. It’s one of her favorite foods and she is always excited when I tell her that I’m making it. We wait all year for summer (and beautiful tomatoes!) to arrive. To be worth the effort, you have to have GREAT tomatoes – in season, bought locally, and deliciously ripe. That is key. If you go to all of the effort to make this with inferior tomatoes, you will be disappointed with the result, I assure you. The recipe itself is VERY flexible and up to your own personal taste. All ingredient amounts are approximate and flexible!!! If they are very ripe, the peels can be stripped off by hand, just by getting the edge started with a paring knife (kind of like peeling a hard-boiled egg?). If the peels are more stubborn, you can cut a shallow “X” (about an inch across) into the non-stem end of each tomato, then submerge them in boiling water for a minute or so, to allow the skins to loosen. After removing from the boiling water, place them immediately into ice water to cool before draining and slipping the peels off. 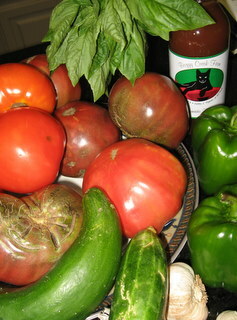 Finely chop about 1/2 cup of the tomato and reserve it, put the rest in a large, glass bowl. Peel and seed the cucumbers. Dice and reserve about 3/4 cup of it and set it aside. Put the rest in the bowl with the tomatoes. Finely chop about 1/2 cup of the pepper and set it aside. Put the remaining pepper in the bowl with the tomatoes and cukes. Add the garlic, salt, pepper, pimenton, oil and vinegar to the veggies in the large glass bowl and puree, using an immersion blender. If you don’t have an immersion blender, you may do it in batches in a regular blender. Add the reserved, chopped veggies and stir them in. Some recipes call for a little bit of tomato juice or beef broth to make the soup thinner, some (like this one on Epicurious) call for breadcrumbs to make the soup a little thicker. I usually find that the texture is OK with just veggies, but just in case…. Pour back into the glass bowl. cover and refrigerate at least 2 hours before serving. Will keep almost a week in the fridge and gets better as the flavors sit and meld together. This recipe can be changed around lots of ways; I never make it EXACTLY the same way twice. If you like it smoother, you can puree the whole thing; if you like it chunkier, you can have more chopped veggies and do less pureeing. If tomato seeds skeeve you out, you can remove the seeds before pureeing. I don’t personally believe in adding canned ANYTHING (V8, tomato juice, tomato paste, etc.) 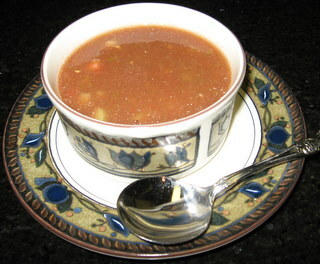 to gazpacho, because I believe that the fresh taste is the best part of this dish, but do what suits YOU. Why it’s probably NOT a great idea to give 9-year olds their own email account…..
HELLO I AM ______ (Boy). DO YOU HAVE A SON WHO SENDS YOU ANNOYING E MAILS PRETENDING HE DOESN’T KNOW YOU? P.S. I HAVE A MOM! For those of you that might want to email Boy, his email address is: Boys’ First Name (nickname version) @ Our Family’s Domain Name.com (same domain name as MY email address). Author laraPosted on July 10, 2007 Categories MiscLeave a comment on Why it’s probably NOT a great idea to give 9-year olds their own email account…..
We’ve heard about Enrique’s Restaurant (in the Ponca City, Oklahoma airport) over the years, from numerous friends. 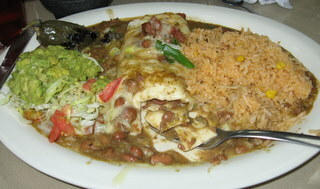 We had heard that it was really good (run by some San Antonio ex-pats) and had really yummy, unusual tortilla chips and great food. Since we were driving near Ponca City on our way home from visiting friends in Wichita, KS, we decided to drop by and give it a try. I grew up with parents that planned our summer road trips around this book, so this doesn’t seem out of the ordinary to me. 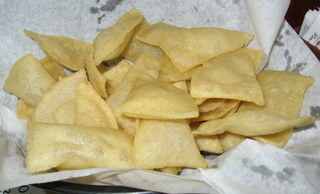 The basket of chips, which were “puffy”, almost like little savory sopaipillas. 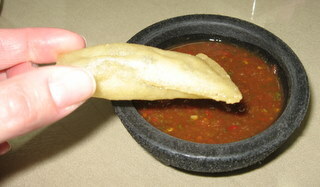 The salsa was yummy and fresh, too, although it had a little more “heat” than I normally like (Hubby LOVED it). Here’s one of the chips close up. They were almost chewy, rather than crunchy, like your everyday chip. Overall, a thoroughly enjoyable meal. 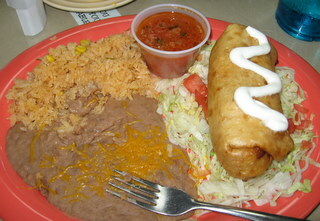 Very Tex-Mex-y, which is how we like it. The service was INCREDIBLE – super friendly and attentive. You can see the runway from the dining room, but being Ponca City, there weren’t a ton of planes taking off, so don’t go expecting to see lots of traffic. So, if you happen to find yourself in Ponca City, it’s worth a stop in. This was the perfect light, Summer dinner. 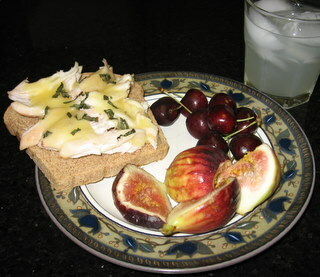 We had some pretty, fresh figs and cherries and some leftover rotisserie chicken. I put the chicken on a nice piece of Great Harvest Honey Whole Wheat bread and put a little cheese and tarragon on top and toasted it until the chicken was warmed through, the bread was toasted and the cheese was melted. Add a nice glass of fresh-squeezed limeade and enjoy.